Last week, Apple CEO Tim Cook attended President-elect Donald Trump's tech summit at Trump Tower in Manhattan alongside other tech leaders, including Alphabet CEO Larry Page, Microsoft CEO Satya Nadella, Facebook COO Sheryl Sandberg, Amazon CEO Jeff Bezos, Oracle CEO Safra Catz, and Tesla CEO Elon Musk. 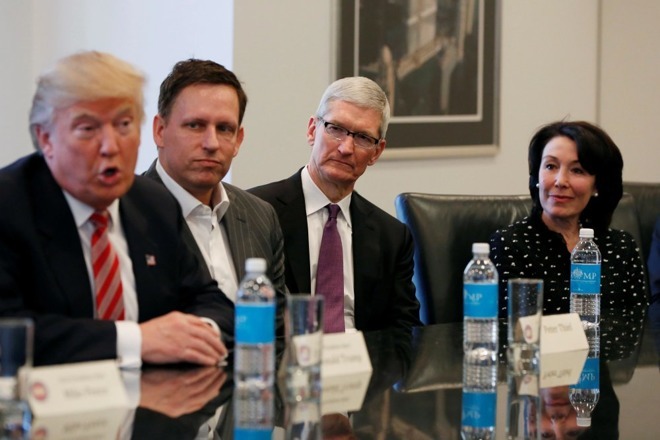 Since the roundtable meeting, which reportedly focused on topics such as job creation and economic growth, Apple employees have wondered if it was important for Cook to meet with Trump, whose stances on issues such as encryption and immigration reform have been viewed controversially among the tech industry. To address those questions, Cook issued an internal comment to employees, in which he said he has "never found being on the sideline a successful place to be." He said "governments can affect our ability to do what we do," and noted the way to make progress on key issues is to "engage." Despite any personal misgivings he may have had in the past, Cook reportedly stayed at Trump Tower after the summit was over to meet privately with the President-elect for further discussions. Tim Cook is right. Exiling yourself from people you disagree with is no way to promote change or reach compromise. Good to see that he does have some class. Can't say that of many other supporters of Clinton, who have been acting in a very disappointing way. Threatening electors to vote against Trump, these useless recounts where Trump still won bigly and whatnot. So this is very refreshing of Tim to say. Yeah, it's Mike Pence and most of the new (evangelical Christian) administration who care if you're gay, then you might get electrocuted straight. At the very least you'll be subject to removal of anti-discrimination legislation, or subject to new discriminatory legislation. Such complete BS. One day it would be good for you to join reality. Yes, and so instead of yelling at you, I'm going to quietly buy a Windows laptop for the first time in my life because of how seriously you fumbled the new MacBook Pros. 'Quietly' being 'publicly announcing on a forum'? Tim Cook is an adult unlike most of today's pajama wearing safe space clowns. We have held the notion for far too long that everyone has to agree on everything to be able to be friends and that isn't true. Now I am not saying Trump and Cook are going to become buddies (although they could if they wanted to), but I am saying that you can disagree with issues and still be civil to one another and perhaps even find common middle ground in cases like this. This 100%. My wife and I disagree all the time. I mean all.the.time. We keep things civil by agreeing that she is right... all the time. Always. Day and night. Year after year after decade after decade. She will always be right. On topic: Tim's right, yelling doesn't change things. 'Cept maybe your sleeping location. Tim Cook, the guy who is a liberal to protect his gay rights and a conservative to protect Apples hidden cash abroad. Tim wants his cake and eat it too. I never understood why you have to be on or the other, liberal or conservative...can't you believe in ideals in both ideologies?